When you search on Google you often get results that have nothing to do with your original search query. Take the search for Appel for instance. You probably would not expect sites about Apple in the search results. Google on the other hand thinks that is what the user is looking for and displays three Apple sites in the top five search results. Google's suggestion to use quotes "" for exact searches works most of the time but not all the time. Even searches in quotes are sometimes "interpreted" by Google. While the search giant may get it right some of the times, they fail at other times. The removal of the + search operator, some say to make way for the Google+ search options that have been implemented in Google Search, has made it even more difficulty to get exact results in the search results. Up until now, users had no real options to force Google to only return results for the query that they typed in. In particular, Google may make automatic spelling corrections, personalize search, use synonyms and similar terms, searches for words with the same stem and making some terms optional. That's a lot of manipulation, especially when users want to find exact matches only. This changes with the new Verbatim search option that is rolled out right now by Google. The new option is hidden in the left sidebar menu and becomes only available after a click on More search tools there. The feature is being rolled out and will be available to all Google users in the coming days. Webmasters should also take note that Google announced that they will apply "similar ideas directly" to their algorithms. The Google Verbatim search option is a welcome addition that experienced users will come to like. Users who want to force Google to search for the exact search term directly can add &tbs=li:1 to the query to do just that. What's your take on Google Verbatim? Let me know in the comments. You can read the official announcement at the Google Inside Search blog. Now if Google would only keep the more search tools menu open by default. My sentiments almost exactly – except I find Greasemonkey slows things down and don’t use it. Hopefully an equivalent userstyle (for Stylish) would be created by some wizard out there. Unfortunately, of course, such custom made add-ons never can update themselves. So even though I habitually alter the ‘Firefox max version’ field to a higher number than is current, extended use of the add-on (as newer Firefox versions continue to appear) can become tricky. And abolish semantics in web search ? I think interpreted queries are one of the big advantages of Google over competitors. Verbatim should not be an alternative but a necessary complement. I personally think they should increase the visibility of the feature. Hasn’t rolled out in my neck of the woods yet, but should be soon! At this time, Verbatim available on Google.com but not yet on Google.fr (France). Google searches have become more and more frustrating – unless you are shopping or looking to socialize. I’ve been using Ixquick. I have no clue what Google is doing here! This is the standard verbatim search (I’ve removed all the additional guff Google adds to its search string, since this produces an identical number of results to selecting the Verbatim option), returning around 902,000,000 results. How is it possible for the more restrictive search (i.e. verbatim) to return around 900 times more than the less restrictive search? I wonder what this one does? It also states it’s a verbatim search, this time returning around 11,000,000 results. IMHO, if Google cannot explain these discrepancies, then Google’s reputation for their search expertise is brought sharply into question. I’m currently testing it as a conversion to a Firefox add-on (as outlined in my earlier comment). Test results: FAIL. No button appeared. Not on a Google search results page, not on http://www.google.com. Maybe it works as originally intended (as a script within Greasemonkey). Has anyone else tried it? I tried it right now and it works. It adds a second button next to the search button (yes really) which triggers a verbatim search. I used Scriptish and it worked fine. Working for me too in Greasemonkey in Firefox..
the “Yes, Really” text of the button. OK, well, now I’ve gotten Scriptish (thanks, Martin – I’d never heard of it before) and the gooverbatim script does as Martin says. Like Robert Palmar I will have to change that unappealing button label. But I pretty much never use Google’s search page (where the button appears). I search from highlighted in-page text or from the Firefox search bar. The button *didn’t* appear where I’d hoped to find it: on a page full of [regular] search results. to the list of pages it where will operate. Now the script is useful for me. Better than nothing, but an auto-default script would be better. Great tip, I did not try it on Google’s encrypted search engine. Good point WebHybrid on adding the Google SSL url. A change that should not have been necessary. And why hide it and give it a name that few know the meaning of? More trickery simple as that! I use Chrome (actually, SRWare’s IRON browser, but for our purposes, here, it’s the same thing), tied to my Google account so that I’m always auto-logged-in to it whenever I launch the browser and go to the Google search main front page. For search purposes, I do that, in part, because some of the search configuration settings are now stored in Google accounts, I’m told (in other words, search setting memory is not all by means of cookies anymore… can’t remember where I read that — maybe here — but it was like a month or two ago or something). By using the IRON browser, I get full Chrome features (except, sadly, for Cloud Printing), but none of Chrome’s phoning-home to Google telling it what I do. But this posting’s not about the IRON browser; I just mention it so that no one reading this thinks I don’t know that by making sure I’m logged-in to my Google account, I make it even easier for Google to violate my privacy. The IRON browser, plus my turning off history and stuff in my Google dashboard (plus my use of plugins like “Do Not Track Plus”, and a HOSTS file, etc.) ensures that I’m pretty much not being tracked… er… you know… to the degree it’s possible to stop it, that is. For this posting, I’ll call it “Chrome,” though, since that’s what most people who use a Chromium-based browser use. Second, I configure my Google search (using “Search Settings,” accessible from the little button with the gear on it in the upper right of any Google search results page (why it’s not also on the Google search main front page, I’ll never know)) so that there’s “no filtering,” and so that “never show instant results” is selected, so that there are 50 search results per page, and so that “do not use personal results” is selected, and so that each selected search result opens in a new browser window (which actually ends-up being a new tab, because I have Chrome so configured); and I also specify no blocking of unwanted results, and I have my web history paused. I then save those as my default search settings. Third, I have Chrome configured to always display the bookmarks bar. …and once there, I set a bookmark to it, specifying that it should be on the bookmarks bar. The point is to just get the button up there on the bookmarks bar; it matters not, at this point, the URL tied thereto. Fifth, I dragged said button to the far left end of said bookmarks bar. … into the “URL:” field; and then I clicked on the “Save” button at the bottom. From that point on, whenever I want to do a fresh Google search (in other words, whenever I want to go to the main Google search front page), I simply make sure that I’m on the tab where I want that to happen (and if I don’t want the Google search to replace whatever’s on any of my opened tabs, then I simply open a new tab) and then I just click on the aforementioned button on the bookmarks bar. …and because I got to the Google search main front page using the URL that the bookmarks bar button uses, the resulting search is already verbatim, by default; and, also, all the choices down the left side of the search results page are already expanded… which is how I like them. In other words, that URL predisposes searches from the Google search main front page to already be verbatim (and secure, via SSL, too, so that no one on a public wifi network can sidejack me). Moreover, any new searches begun from the search box at the top of the search results page will also be verbatim. 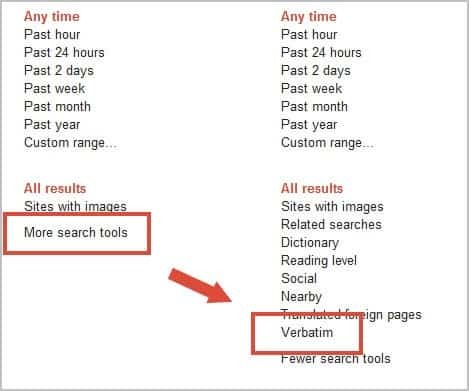 Undoing verbatim, at that point, in fact, requires clicking on the red-lettered word “Verbatim” down near the bottom of the list of tools over on the left side of the search results page. And verbatim can, from there, be toggled on and off as desired, just as the article to which this is a comment describes. This methodology, in case it isn’t obvious, makes verbatim the default as long as I begin from the Google search main front page using the URL that I herein prescribed; and which is what the Google search button on the bookmarks bar takes me to if clicked upon. And notice that no script, which may later break, such as is discussed in the other comment postings, here, is required. I prefer verbatim as my default because I’ve always used whatever operators are necessary to get my searches exactly the way I want them. In other words, I’ve never been the kind who just types a few words into the Google search box and then hopes for the best. So doing was a big waste of time even BEFORE Microsoft touted Bing as a “decision engine” (rather than a “search engine”), which, in turn, caused Google to follow suit and make Google start “thinking” for us, and insensibly anticipating what it thinks we meant… which drives people like me, who’ve always known what to key-in to the search box so that we drill right down to whatever we want with aplomb. Using verbatim turns off all that business of Google thinking for me; and so, then, lets me use my beloved operators to my heart’s content, like in the old days. I group my phrases in quotes, use the minus symbol to specify what I don’t want on the resulting pages, and before Google disabled the plus symbol (apparently so that it wouldn’t confuse the system when people make searches involving Google+), I used the plus symbol to specify the search terms which absolutely MUST be on the resulting pages (which Google claims the quotation marks will now ensure, in lieu of the plus symbol… but I’m dubious). All of my searches, for as long as I can remember, have routinely included the use of operators in that way, and so “verbatim” is exactly what I want. Again, I don’t need Google doin’ any thinkin’ or anticipatin’ for me. And if I ever do want Google to “think” for me, I can simply go down near the bottom of the already-expanded list of tools on the left side of any search results page and click on the red-lettered word “Verbatim” and toggle verbatim off. I tend to never toggle it back on again from there, though. If I want to return to verbatim mode, I tend to simply click on the Google search button at the far left end of my bookmarks bar and return to the Google search main front page and kinda’ just start all over in default verbatim mode… but, hey, that’s just me. I dunno’ if that’s helpful to anyone, but that’s how I do it, for whatever that’s worth. Thanks for the explanation. I do use DuckDuckGo as my main search engine, primarily because of Google implementing all those personalizations, ads, product ads and what not in the search engine that I do not want or need. I wrote an opera extension to sanitize google output (which produces exact searches by hidden quotes and filtering invalid results and some more stuff). Everything else is (more of) a pain in the head, including verbatim mode. Mathias looks interesting, will you submit it to Opera’s extensions repository?